Guided reading is an instructional method that allows students to learn how to read and comprehend text. As students progress in their reading abilities and understanding, the difficulty of the text is increased. Teachers determine student reading levels by administering benchmark assessments, or developmental reading assessments (DRAs). Once student reading levels (DRA reading levels) are determined, teachers place students in guided reading groups with other peers on the same DRA reading level. Each group usually has around six students. The teacher then selects a text to teach each group based on their learning needs. The teacher usually meets with each group for about 15 minutes twice a week to give students small group reading instruction. Guided reading helps students receive more individualized and personalized instruction to help them progress with their reading development and comprehension. 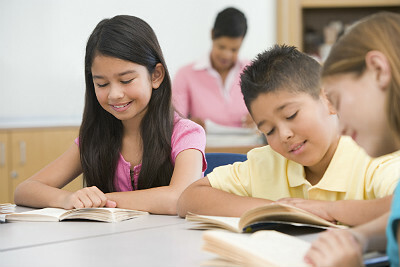 English language learners (ELLs) often struggle with reading. They struggle with decoding the text, pronouncing the words, fluency and understanding the content (vocabulary). For these reasons, ELLs usually have difficulty following along and being actively engaged during the learning process in standard guided reading groups. This is due to their lack of background knowledge, English language skills, educational experiences and more. Modified guided reading can be used to help ELLs learn how to use, read, understand and relate to text. Adapting guided reading instruction through modified means, will improve their overall language cognition and reading abilities. ESL teachers and classroom teachers must be equipped with the knowledge and tools to effectively teach modified guided reading. Many ELLs read below grade level based on DRA reading assessment data. It is crucial that these students receive adequate and aggressive intervention methods to help them progress toward grade level reading independence. It is the role of the ESL teacher, classroom teacher, reading specialist, grade-level teams and administrators to understand and support ELL reading needs and interventions. All who are involved in student ELL assessment, instruction, and data collection, must know how to properly teach ELLs through intervention and modified guided reading methods. What are ways teachers can modify guided reading? What strategies and tools can be used to adapt instruction to help ELLs? To plan for guided reading select a culturally relevant and appropriate book that is on the DRA reading level of students. The book selected should be nonfiction and should utilize concepts and language students are familiar with to access prior knowledge. The book should also incorporate some new concepts, sight words, phonics and vocabulary that will help ELLs further progress in their English language learning. Read through the text. Make note of any vocabulary or language that may be difficult. Place highlighting tape over words. Write notes, question prompts or any other important text information on sticky notes and place on appropriate pages in the book. Create a thorough lesson plan for modified guided reading instruction. Create objectives based on standards, learning needs and text features. Write the lesson plan to meet the objectives through interactive modified and adaptive guided reading intervention. Access prior knowledge, or build prior knowledge if students do not have the knowledge. Discuss the pictures in the book through a picture walk of the text. Have students make predictions to practice guessing what happens in the book. Teachers can use technology to create picture sheets or journals using words from books being studied. During the prereading process there are several approaches to preparing and teaching unknown vocabulary words. First, make a list of the vocabulary words students may not know. Create a vocabulary sheet of the words using a word-processing program. Add visuals, either photos or clip art, of the words next to the text. Leave space for students to write a sentence about the picture using the word. Second, have students scan the words to point out words they do not know. Make a list of the words the students point out. Next, if you have access to a laptop or touchscreen computer, type a list of the words as students are talking. Search quickly for clip art and images. Show the images to students and prompt a discussion about the word and image. Next, add the image to the vocabulary picture sheet and print it. If you have an interactive whiteboard or tablet devices, have students type the words to practice spelling. Then, follow the steps above. You can then have students individually work on their device to write sentences with the words. Double the guided reading time from 15 minutes to 30 minutes or give a double dose of guided reading of two extra lessons a week. ESL teachers can work with classroom teacher, reading specialist, administrators, and other appropriate educators to create a plan that works. Make sure to give students adequate wait time. Implement repetition into your lessons and plans. Utilize reading support in the classroom design and centers. Use dry erase boards and magnetic letters to practice spelling sight words. Use envelops, pictures and phonics sheets to teach blends, CVC words and vocabulary terms. Create sight-word lanyards for intervention. Assign students a lanyard to wear and keep with them throughout the school day. Give students a sight-word card to put in front of the lanyard. Have students practice the word throughout the day. Have team members randomly ask students what their word is. Students must look at the word and read it. Continue to give students new words to add to their lanyard once they have learned a previous word. Help motivate students to learn the words by creating an incentive method. For example, once students show that they have learned 10 words they can get a prize from a prize basket. Auditory practice of phonics, sight words and vocabulary is critical. Create audio recordings and send them home to parents for students to practice. Allow students speak text softly while reading. Have students use dollar store toy microphones or curved pipe tubing to speak in so they can listen to themselves read. Use highlighters to point out sight words, letters, blends or text features. Use highlighter tape which is easily removable. Use small flashlights to highlight words. Or create make-shift text highlighters. Use colored clear see through binder dividers. Cut them up into small rectangle pieces about the size of smaller words in books. Students can use these make-shift highlighters to highlight anything in the text. Use sticky notes for students to cover words or text for discussions, write sentences or to answer questions. Sticky notes can also be folded to help students learn blends and CVC words. Use strings to teach stretching words, text and other concepts that involved lengthening. Use pointers or finger puppets to help students with tracking. Create vocabulary, phonics and/or sight word audio recordings with books that contain matching text. Use these recordings in classroom centers and send them home for students. Use voice recorders in the classroom for students to record and listen to themselves read. Use classroom computers, tablet computers and the interactive whiteboard to listen to books on tape or to practice computerized reading lessons. Use graphic organizers to help students with comprehension or features of the text. Use pocket or literacy charts during the lesson for vocabulary, phonic awareness, text features, comprehension or writing development. Asking critical thinking questions is important for teaching comprehension. Each lesson should include critical thinking questions. Use questions to help students understand components of a text. These questions can be about the setting, plot, characters, main idea, details, predictions, and making inferences. Students need wait time to process and respond. The teacher should allow adequate time for students to respond before responding himself/herself. One of the best ways to help ELLs reading below grade level grow faster in their reading development is through teaching parents how to support their children at home. Create or find packets for students to use that include a booklet with text and audio support. Send the packets home so students can practice reading text. Send copied levels books home. Create special workshops or meetings where parents can learn how to use the leveled books at home with their children. Parents most often will not have the English abilities to help their children. They need to be taught how to do it. In specialized meetings or workshops, teach parents how to use highlighter tape, sticky notes, make-shift highlighters, finger puppets and other inexpensive tools that can be used for reading development. Parents can work with their children at home once they have the resources and know how to use them. Use support methods through discussions in PLC meetings (Personal Learning Community). What do you do with data collection? Use data results for creating modified guide reading plans and intervention methods. Collaboratively work together to create thorough plans that will work. English language learners will begin to show progress in their reading development and comprehension when they are given modified guided reading instruction and intervention that uses adaptive features tools and strategies like the ones above. Standard guided reading is not enough for students who are performing below grade level. It is crucial that planning and instruction is adapted for ELL instruction and success.